Actividad 2: ¿A quién le importa? 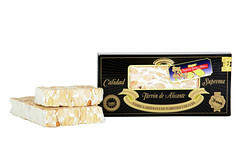 Turrón is hard nougat, made out of almonds, originally, eaten in Spain for Christmas. There are now so many variations that I can’t just give the description of its original form. Traditional turrón (duro). Photo by turronesprimitivorovira. Every household will have some turrón on the table. Every Christmas hamper will have some turrón. Every Spanish duty-free will also have one, so if you’re curious about this traditional, ever-popular sweet but you’re reading this during the non-festive season, then you can grab one in the airport. There are different types of turrón. The original one is hard (duro), very hard, so be careful when you first bite into it. Also be careful as it is highly addictive. When I broke my leg many years ago, my mother brought some for the hospital staff on the day I got sent home. She left it at the reception with one of the nurses. When we left, we saw the happy nurse munching away. I don’t think anyone else had a taste of Spanish Christmas. 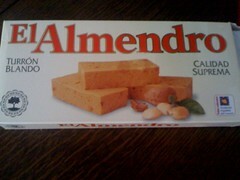 You also have “turrón blando” (as featured in the photo on the right) which is soft (blando). You have “turrón de chocolate” (yes, you guessed right), “turrón de nata y fresa” (cream and strawberries) and many others. Many years ago (in the 70s?) a brand of turrón launched one of the most memorable Christmas campaigns on television. Thanks to the wonders of YouTube, I can share this with you, although this one is a 90’s version. I told you the marketing agency struck gold. Television plays a really important part in people’s lives. As in most European countries, children have the time of their lives in front of the television, watching films and being shouted at by adverts. They can also watch the “cabalgata de Reyes” (the Kings’ Parade) on the 5th January, on their regional television channels, when the Three Kings arrive into the regional capital cities. Advertisers go completely mad on Christmas time and sometimes create some gems. Pretty much like the El Almendro advert, the tune to the generic one created by Famosa, the toy manufacturer, has lasted many decades. Below you can see the 70’s version and the 90’s version. I leave you with them. But before you go, if you wish to find out more about Christmas in Spain, feel free to listen to the podcast, U is for Uvas.